Gallen-Kallela was born Axel Waldemar Gallén in Pori, Finland in a Swedish-speaking family. His father Peter Gallén worked as police chief and lawyer. Gallen-Kallela was raised in Tyrvää. At the age of 11 he was sent to Helsinki to study at a grammar school, because his father opposed his ambition to become a painter. After his father's death in 1879, Gallen-Kallela attended drawing classes at the Finnish Art Society (1881-4) and studied privately under Adolf von Becker. In 1909, Gallen-Kallela moved to Nairobi in Kenya with his family, he was the first Finnish artist to travel south of the Sahara, and there he painted over 150 expressionist oil paintings and bought many east African artefacts. But he returned to Finland after a couple of years, because he realized Finland was his main inspiration. Between 1911 and 1913 he designed and built a studio and house at Tarvaspää, about 10 km northwest of the centre of Helsinki. In 1918, Gallen-Kallela and his son Jorma took part in the fighting at the front of the Finnish Civil War. When the regent, General Mannerheim, later heard about this, he invited Gallen-Kallela to design the flags, official decorations and uniforms for the newly independent Finland. In 1919 he was appointed aide-de-camp to Mannerheim. From December 1923 to May 1926, Gallen-Kallela lived in the United States, where an exhibition of his work toured several cities, and where he visited the Taos art-colony in New Mexico to study indigenous American art. 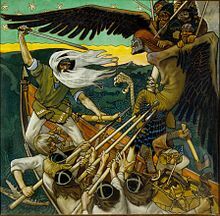 In 1925 he began the illustrations for his "Great Kalevala". This was still unfinished when he died of pneumonia in Stockholm on 7 March 1931, while returning from a lecture in Copenhagen, Denmark. His studio and house at Tarvaspää was opened as the Gallen-Kallela Museum in 1961; it houses some of his works and research facilities on Gallen-Kallela himself. ^ Martin, T. & Pusa, E. 1985, p. 5. ^ "Akseli Gallen-Kallela (1865-1931). A Passion for Finland". Musée d'Orsay. 2012. Retrieved 30 November 2018. ^ Martin, T. & Pusa, E. 1985, p. 6. ^ a b c Reitala, Aimo (1997). "Gallen-Kallela, Akseli (1865 - 1931)". 100 Faces from Finland – a Biographical Kaleidoscope. Biographical Centre of the Finnish Literature Society. Retrieved 4 February 2017. ^ a b Martin, T. & Pusa, E. 1985, p. 12. ^ Martin, T. & Pusa, E. 1985, p. 37. ^ Martin, T. & Pusa, E. 1985, p. 39. ^ "Gallen-Kallela 150 years". Gallen-Kallela Museum. Gallen-Kallela Museum. 2015. Retrieved 4 January 2017. ^ Ringbom, Sixten (1996). "Gallen-Kallela, Akseli (1865 - 1931), painter, graphic artist, designer". Grove Art Online. Oxford Index. Retrieved 4 February 2017. Wikimedia Commons has media related to Akseli Gallen-Kallela. This page was last edited on 11 April 2019, at 07:03 (UTC).